Stanley LeBlanc, Jr. was born June 18, 1945 in the hamlet of Olivier, LA in Iberia Parish. In 1963, after graduation from New Iberia High School, he joined the United States Marine Corps. In June, 1965, he was assigned as a security guard at the United States Embassy in Paris, France. While working there, he met his wife Marilyn Boothby on July 3, 1965 and they married in June, 1967. They have a daughter, Sarah, and a son, James, and two grandchildren. In September, 1967, LeBlanc enrolled at USL, now ULL, and completed his BA degree in history/political science in the fall of 1970. 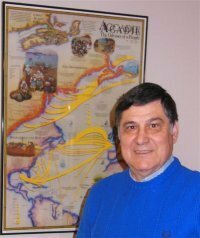 After graduation, he was selected as a management intern with the Social Security Administration where he served in technical, administrative and management positions until his retirement in June, 2003.
http://www.acadianmuseum.com/cemeteries/cemetery.html. The photos are also available onsite at the Acadian Museum on USB drives.